WASHINGTON (Reuters) - U.S. central bankers thought they should get more regulatory powers in return for providing cheap cash to Wall Street banks during the 2008 credit crisis, according to Federal Reserve transcripts released on Friday. Powerful investment banks such as Goldman Sachs and Morgan Stanley had access to a raft of measures to prop up markets during the 2008 credit meltdown, but the Federal Reserve had little say over them. 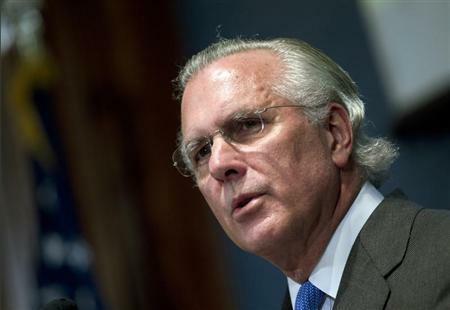 "I am just a little worried about being taken advantage of here," Richard Fisher, head of the Federal Reserve Bank of Dallas, said in a March 2008 conference call of the Fed's policy-setting Federal Open Market Committee (FOMC). "The question is, what do we get in return, and how do we make sure that, since we are not the regulator of these dealers, there is indeed discipline?" the transcripts show Fisher as saying. That concern foreshadowed later efforts to do away with the expectation that the fear of a financial meltdown would force governments to always stand behind banks in a crisis, something that Wall Street critics say can encourage reckless behavior. The 2010 Dodd-Frank Wall Street reform law prohibits taxpayer-funded bailouts of "too-big-to-fail" banks, but some politicians have pushed for further measures to ensure there is not a repeat of the crisis-era bailouts. The Fed, which is still dealing with fallout from the crisis and the 2007-2009 recession, released transcripts of all 2008 meetings of its FOMC on Friday after the typical five-year lag. The U.S. Securities and Exchange Commission oversaw the securities activities of the biggest investment banks in 2008, and only monitored the parent companies through a voluntary system known as the "Consolidated Supervised Entities" program. While Wall Street investment banks were not regulated by the Fed, they could participate in the central bank's emergency measures to provide them with more collateral and to prop up short-term lending and prevent a further spreading of panic. "My concern is that the safety-and-soundness disciplines that we apply don't appear to be applied to these broker-dealers," the Dallas Fed's Fisher said at the March meeting. During that year, the independent investment banks all succumbed to the crisis in rapid succession. Bear Stearns was rescued by JPMorgan in March, while Lehman Brothers went bankrupt in September, setting off a global panic. Also that month, Merrill Lynch was bought by Bank of America , while Morgan Stanley and Goldman Sachs changed their legal status to become bank holding companies, putting them under Fed oversight. In the months leading up to the Lehman bankruptcy, the Fed and the SEC signed an agreement to share information on supervising the broker-dealers, but some policymakers were already saying more was needed. "We have an opportunity to start with a blank sheet of paper, with four institutions over the period, and figure out how to be really, really good regulators," Kevin Warsh, then a Fed board governor, said in a June 24 meeting. Some also were worried about the increased concentration of the U.S. financial industry, as several players fell away or were gobbled up by larger banks, saying this added to the too-big-to-fail problem. Dodd-Frank cracks down on big banks through tough capital and liquidity standards, and gives the Fed greater power over the largest financial firms. The law also requires them to craft plans, known as living wills, showing how they could go through bankruptcy rather than being bailed out in a crisis.